Phantom/Ghost may be a band, but the members – Thies Mynther (who plays in the bands Stella, Superpunk and Das Bierbeben) and Dirk von Lowtzow (who is the singer of Tocotronic) – sometimes consider themselves to fulfill roles similar to athletes. “[Music can be] challenging and…difficult [and] very advanced,” von Lowtzow said, sharing that he sees it as something like playing sports, in that he can only improve at, and eventually hope to master, music. In particular, von Lowtzow is referring to Phantom/Ghost’s current approach to music, which is pushing themselves to experiment with complex genres. As an example, the first three Phantom/Ghost albums were electro-centric, with an emphasis on beats and synths. 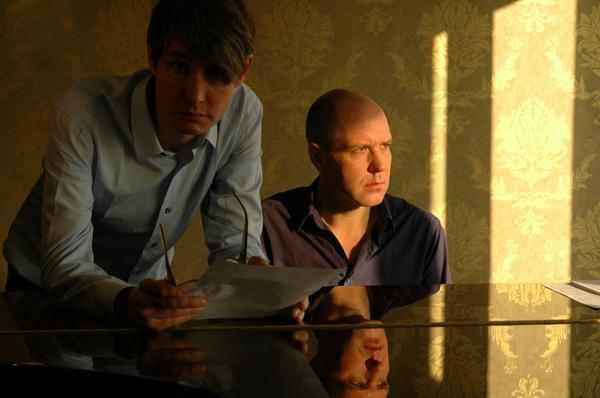 However, for the fourth and most recent album, 2009’s “Thrown Out of Drama School,” the duo wanted to push upon the confines of genre. Trading in electronic instruments for a grand piano, the two drew upon their fascination with Broadway musicals and and applied it to a stripped down format, something which von Lowtzow described as “very simple and very basic,” and far removed from what both of them were accustomed to playing. Recently, the two have recorded four new songs, which they hope to release on their current label, Dial Records, by the end of the year. According to von Lowtzow, the proposed 12-inch record goes a step beyond the last album, while still retaining some of the same musical principles. Because von Lowtzow is based in Berlin, whereas Mynther resides in Hamburg, the two write separately, each contributing close to 50 percent of the rough song material. Speaking to his own songwriting process, he shared that his favourite time to write is when he is half-conscious, either early in the morning or late at night. As for rehearsing, von Lowtzow said the distance between the two makes it so that their rehearsing is somewhat unconventional, in that it only occurs prior to live performances. Instead, the two will play shows every six-to-eight weeks, either flying or taking the train to the locations. During soundcheck is when they take the time to rehearse, running through the songs and working out kinks. And in regards to transporting the piano, he said the venues provide it for them. Phantom/Ghost plays tonight with special guest Michaela Meise at ://about blank in Berlin. The show begins at 20.00 and is part of an anti-nationalistic protest against Tag der Deutschen Einheit, or German Unity Day. This entry was posted in Interview and tagged Feature, German, Interview, Phantom/Ghost. Bookmark the permalink.